Here we discuss the question and pitfalls of how to make a nightlife application. As relations in our society are reduced to swipes and likes, events industry has also experienced a major change. And this change are the event apps we observe growing like after-the-rain mushrooms. We hang out all the time. No matter what kind of hang out it will be - a wine and dine evening in the sophisticated restaurant, an exciting Red Hot Chili Peppers concert or a mind-blowing club night with some world-famous DJs involved, we still need to hear about it. In our information-overloaded world there are so many signals fighting for our attention that we find ourselves eventually flooded by too many triggers. We tend to get less organized, and our short-memory won’t pass the simple health-check test. But what if you didn’t have to set reminders for the events must visit? What if you got reminded and notified once something worthy appears on the scene?What if we make a mobile app for Nightclubs? And that’s where the event apps come into play. This is a perfect timing for them to act on, as their huge bonus is that the whole world could be their target market. From New York to Tokyo, people hang out everywhere, so their urge for updates is a field you can work on. There are a few examples of a nightclub app built that have actually improved all of these metrics - and made out a great nightlife-event application, of course. Since that time Barchick has progressed significantly - it now is on in 56 destinations worldwide! Add a handy and user-friendly UX (made in a form of a dialog with a user) on top of this, and what you get is a popular nightlife application. 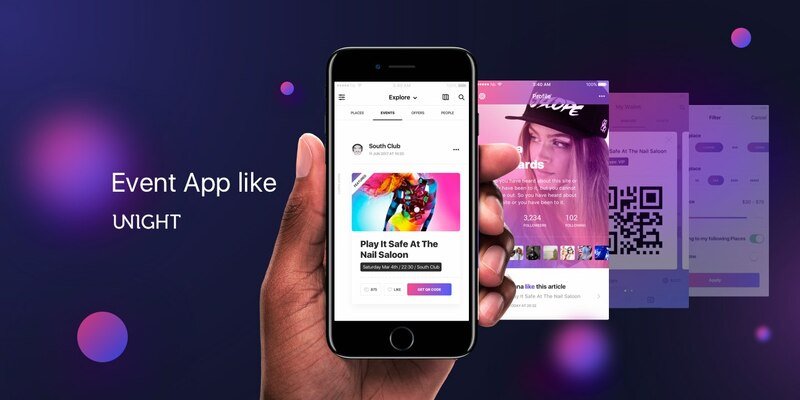 As for a monetization model for a nightclub app development, Barchick firstly were a super-free option - which changed later to an in-app paid advertisement. Barchick’s founders didn’t want to monetize their app first as they wanted to gain a solid user base first. Now they are planning to expand with the Barchick YouTube channel with drink brands and bars. Whether it is a hot date or a loud party you long for, Social Status will find one for you - according to your social status of course! Monetization model: SocialStatus is completely free for now. However, we should wait and see how the guys from Phillipines will generate revenue out of their event app development. 3. You are In List App. Everyone of us has dreamed (at least once) about being treated like a superstar - and In List application plays on your feelings here. Within this mobile app you can get a VIP-access to the most luxurious places all over the 45 cities worldwide! With smooth interface and good-looking design no wonder In List makes it’s way to the users’ hearts. In Lists founders generate revenue by charging the venues for being listed and the ability to post events. There are a few features without having which the app can not function properly and attract users worldwide. Mapping feature. This would be extremely essential as not all of your users are familiar with the area the nightclub is located in. The power of GPS could be used to bring them at venues doorstep. Listing and calendar. In your nightlife app there have to be events posted regularly, as your users will go looking for them. They need regular updates on the trendy parties, and, in order not lose the thought of them in the information flood, they need to have all of them scheduled. Push-notifications feature. In order not to miss the lively and exciting party your users need to be notified frequently about all the changes. Invite User. A good way to obtain a huge user base is by letting users invite other users and get some sweet perks for this to those who invited newbys. Share App/Event/ Venue to social networks feature. This would also be helpful for the user base growth. You could encourage your users to tell the digital world about your app by providing some bonuses for this. For this purpose you’d also need the like and comment features - to let users share their emotions within the community you build. Recommendations feed. You know this feeling when you have been to many places around you, but you’d like to explore something different? Your users most likely know it too, and that’s why they would really appreciate an app that recommends them some new venues to visit. News feed. In the mobile application devoted to the nightlife glitter news feed needs to include a few types of content - photos & videos posts,as well as event and place descriptions and improvements. Loyalty bonuses feature. Marketers worldwide have already proved the efficiency of the loyalty programs - they help boost growth and your product’s reputation. When you provide small bonuses, it makes users feel respected - so that they want to come back next day. And that’s the goal your app possesses. Which Technologies Do You Use When You Make a Nightlife App? Server part - Ruby language, several Ruby frameworks (Sidekiq, Haml, Config). You can get the full list on our. Our expertise in making nightlife apps cover Unight - a one-of-a-kind platform giving you direct access to dining and clubbing venues in your city. Users can easily manage the parties they check-in at, share photos and events, and receive discounts and bonuses at their favorite spots. Unight is a one-of-a-kind platform giving you direct access to dining and clubbing venues in your city. Users can easily manage the parties they check-in at, share photos and events, and receive discounts and bonuses at their favorite spots. If you are looking to create a nightlife app, then you ought to consider where the content (like venues info & description, events creation, addresses etc.) will be gotten from. If you or your team are the one who will put all these data, then CMS-admin panel will be more than enough for you. Though if you'd like the venues themselves to post updates and generate content, for this case you not only need to model their CMSs, but also think of the value you will provide them with. You will definitely need to motivate venue owners, which might be more complex and expensive than it seems. Auto-set integration with some news-posting service could also be an option, but this as well will require some development and set up expenses. How Much Does It Cost to Build a Nightlife Event App? If you are wondering how to make your own event app with all of the features described above, a mobile application for nightlife is not the longest project ever to realize. A basic single platform (iOS or Android) app + web part + design could be created within the course of 2 months. Different software development companies have different rates for the job to create an event application, but on average calculating the cost of making a nightlife app, the rough numbers a simple nightlife event app may cost start at $ 20k for one platform (back-end and design included). Of course, the complexity of tech used increases the cost to develop an app for nightlife. The Unight platform, for instance, would take more time and resources - as systems of this size cannot be built in a day. As fast-paced and contradictory as our world has become these days, it is almost impossible to imagine a disconnected life. Human as we are, we wish for love, we fear death and we wish we had more time. Event apps protect you from unreliable venues, help you socialize and save tones of your time. Isn’t it a good investment into perspective? Hope now you have a better understanding of how to make an event app. Written by Dmitry Dobritsky and Elina Bessarabova. Flats For Pets. A Guide To Creating An Airbnb For Pets.